TORONTO, January 25, 2018 – While the Big Four accounting firms are among the strongest brands in the world, the impact of accounting scandals can be quantified on intangible assets such as brand value. The Global 500, an annual report on the world’s most valuable brands by Brand Finance, headquartered in London, U.K., ranks the world’s top brands by value. Three of the Big Four post the same elite AAA+ brand rating as Ferrari. 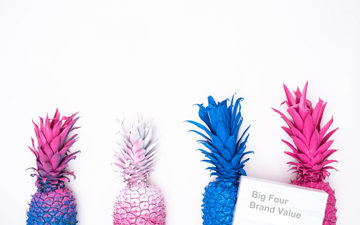 According to the report, Deloitte is the 46th most valuable brand in the world, tops amongst accounting firms, up from 57th in 2018, with a Brand Strength Index (BSI) score of 91.2 (brand value US$29.6 billion). Deloitte pulled ahead of last year’s sector leader, PwC, which fell in ranking by 13 places to 61st, with a BSI score of 89.8 (US$24.9 billion). EY jumped 19 spots to 64th, attaining elite AAA+ status with a BSI of 89.7 (US$23.2 billion), having achieved fast growth in both brand strength and brand value in recent years since 2015. By quantifying brand value, the annual report also helps to measure the impact of scandals upon the global accounting profession. KPMG fell 14 spots to 134th in the global rankings, sandwiched between Airbus and China CITIC Bank, trailing its Big Four brethren with a BSI of 83.2, down four per cent from 2018. The accounting firm’s brand has been tarnished by scandals in the U.K. (Carillion), South Africa (the Gupta family), and the U.S. (PCAOB inspection scheme). The KPMG brand is valued at $12.9 billion for 2019, roughly half that of EY, earning an AAA- rating. Coming as it does from the U.K., where successive accounting scandals have dominated headlines in the financial press, the report notes that “the success of the Big Four, however, may be dampened by the winds of change already swaying these firms to take bolder steps towards modifying their traditional consulting models. KPMG is a leader among its counterparts in one area, however. KPMG CEO Lynne Doughtie is one of only five women in the Brand Guardianship List, a ranking of the world’s best “brand guardians.” In a remarkable irony, the list is headed by Amazon CEO Jeff Bezos, described as “the world’s most successful brand manager among his peers.” Bezos is, of course, in the midst of divorce proceedings with his spouse, MacKenzie, who has been credited with building the Amazon brand. Doughtie ranks as the 71st best brand guardian in the world, sandwiched between the CEOs of JD.com (China) and Citigroup (U.S.). The top five brands in the world are all tech firms, ranked in order from highest to lowest: Amazon, Apple, Google, Microsoft, and Samsung. The Big Four accounting firms are listed under “commercial services,” perhaps reflecting their growing emphasis on and stake in consulting services. And where does Canada lie in the global rankings? The top five Canadian brands in the index are Canada’s Big Five banks, with RBC ranking the highest at 97th. After the banks come media conglomerates Bell, Telus and Rogers. One “new” Canadian company makes the list, Circle K, the rebranding of Mac’s Milk. Colin Ellis is the editor of Canadian Accountant. Read The Global 500 from Brand Finance.